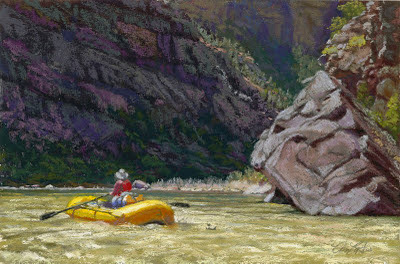 Bio: Don Rantz of Prescott, Arizona, studied Fine Art at the University of Northern Arizona. He has illustrated three childrens' books with his wife, Beth Neely, and he enjoys working in wood. Since 2002 Don has been painting in pastels, recording the monumental landscapes of the American South West. 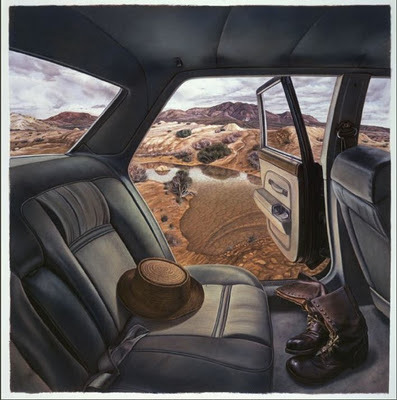 His work has won significant awards, including the Phippen Museum Art Show and Sale, the New Mexico Pastel Society National Show, the 8th Pastel 100 Ruth Richeson/Unison Pastels award, and the 11th Pastel 100 Best of Show. Style: Realist. Rantz works on Wallis sanded paper with Unison pastels. The scale can be large – his recent Pastel 100 winner was a commissioned painting of 30 x 40 ins. but he also has pieces as small as 6 x 9 in. Check out the Artists Network site for more information on his working technique. Navigation: The links remain available on top of page. Gallery: Current Work; Current Work – Collectors’ Room; Archives; Prints. Bio: Sharon Allicotti graduated with an MFA from California State University, Long Beach, School of Fine Arts in 1987 and is currently an instructor at the Los Angeles Academy of Figurative Art in Van Nuys, Ca. She is also a graduate programme mentor at the Laguna College of Art and Design. Her many awards include a Purchase Award, Works on Paper: Beginnings, Brand Library Art Galleries, Glendale, CA, in 2009. SHe had a Residency Fellowship, at the Helene Wurlitzer Foundation of Taos, New Mexico, in 2003. Apat from group shows she has had solo exhibitions in Phoenix, San Diego, Las Vegas, Norwalk and Mount San Jacinto. 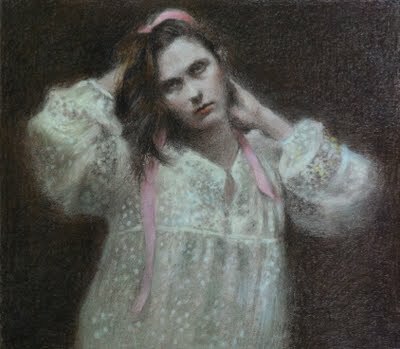 Her work was featured in an article in the August 2010 Pastel Journal. It is worth visiting http://www.artistsnetwork.com/articles/art-demos-techniques/pj-allicotti to see her unique artistic process at work. 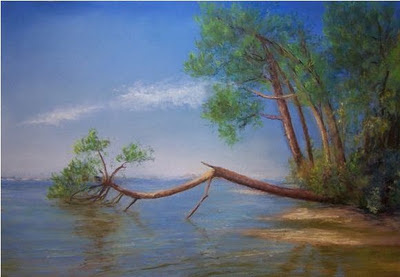 Gallery: Galleries: Paintings in Pastel; Drawings; Oil Paintings. Image View: Click on thumbnails to enlarge in a slideshow, or click again to enlarge further. Information is provided on each piece, if you click on the word Description at bottom left of viewer. Download is blocked by disabling the right click function. However, Mojave Rain Pool did not have the dimensions attached. Bio: Sam Liberman did not take to painting until he was in his early 40s. He was trained as a lawyer and conducted civil rights litigation in his home town of St. Louis, Missouri for many years. But he has now been painting colorful art work for over 35 years. He now works primarily with pastels, while also fashioning a number of oils each year and drawing on a regular basis. 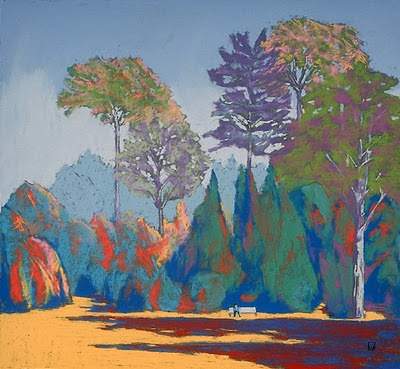 His art education began in a class with Sheldon Helfman, and he has studied pastels with many excellent teachers, including Doug Dawson, Albert Handell, Colleen Howe and many others. He did not consider himself a professional artist until the 1990s when he gradually wound down his law practice. 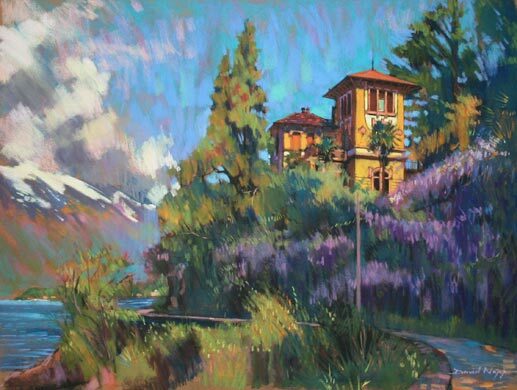 In the late 90s, he and his wife, Terri LaBriola moved to Sacramento, where in addition to the Sierra Pastel Society he is connected to the Capitol Art Center and the S12 Studio and Gallery. He often paints and draws there, as well as exhibiting his work. Sam’s paintings have been exhibited in over 50 competitive national and international art exhibitions. In June, 2009 he had a one person exhibition at the prestigious Butler Institute of American Arts. Navigation: The links remain available on top of page. Navigation is well facilitated. 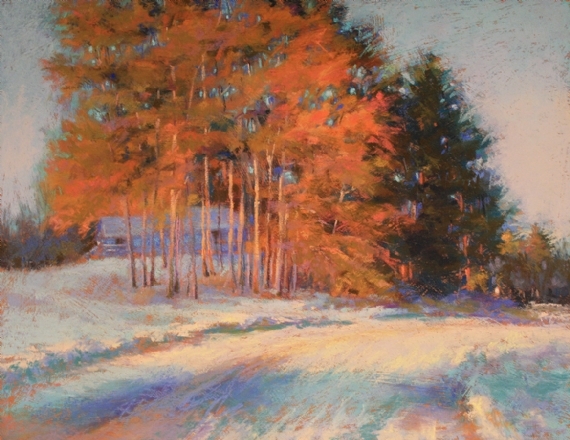 Gallery: Works: Pastel Landscapes; Oil Landscapes; Figures; Plein Air; Still Life; New Paintings. Image View: Click on thumbnails to enlarge in a slideshow, or click again to enlarge further. Full information is provided on each piece, including commentary, dimensions, medium, and prices. Auguste in the Parc is 21 x 23 ins, 550 x 507, 272 KB. Blog : Sam comments with honest self-criticism on his work in his blog. However, when I looked some images refused to load or have a missing link. Bio: I have little biographical information on Simone Lainé but I suspect that she works and exhibits mostly in and around Paris- there is a list of salons on her website. She attended the École de l'Union Centrale des Arts Décoratifs in Paris. She must also teach, as I have found a reference to the “ Simone Laine School, one the most rigorous and professional Parisian schools.” She has been Director of Art and Design Drawing at St Mandé – now on the Parisian metro as St Mandé Tourelle. S’il y a quelqu’un qui peut me renseigner, j’en serais très reconnaissant. Style: Impressionist. She reminds me somewhat of Jean-Claude Baumier. Navigation: This website is presented in French and in English. Image View: Click on thumbnails to enlarge in a slideshow, or click again to return to gallery. Clicking on the Catalogue button on the top left of then pages opens a list of titles, dimensions, and prices. Un matin au bois is 57 x 38 cm, 900 x 613, 446 KB. Bio: Breton (France) artist Jean-Yves Marrec was born inn Brest in 1961. 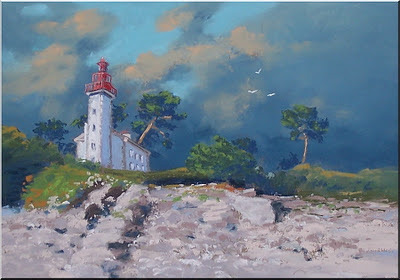 Painter and decorator by trade, his knowledge and fascination with colour led him to become a prolific and dedicated archivist of the Brittany littoral. Self-taught, his passion for pastels has led him to explore the world of painting via the meandering route that many self-taught painters follow – exhaustive reading, studying colour theory, perspective, art history, meetings and discussions with fellow artists, minute examination and analysis of the work of others. His dedication and talent has been duly recognised – he is the recipient of numerous awards for his work, and he has participated in group and solo exhibitions since 2005. He was recently (2011) a featured artist in the pastel supplement of the French journal Pratique des Arts. Jean-Yves Marrec is a member of the Association de peintres et sculpteurs de Quimper Cornouaille. Jean-Yves Marrec est peintre pastelliste Quimpérois, né à Brest en 1961. Autodidacte, le pastel est pour lui une véritable passion. Il s'est formé au fil du temps, au contact d'amis peintres et de différentes rencontres. Sa carrière professionnelle lui a fait côtoyer « la couleur » de toutes les manières possibles. Peintre en bâtiment de métier puis peintre décorateur, il suit ensuite une longue formation qui lui fait approfondir le travail sur la théorie des couleurs, les perspectives dans leur ensemble, la pédagogie et l'histoire de l'Art. Il devient formateur en peinture en C.F.A. Il a beaucoup lu, regardé et analysé la peinture des autres. Il dit: Je pense que la curiosité nous amène à apprendre et à mieux comprendre ce qui nous entoure! Subjects: Landscape, especially coastal views. Jean-Yves has a special love for boats as a subject, especially if stranded or abandoned. Navigation: All links remain available on top of page. This is a French website; but it has a translate button on the top left of the main page. Gallery: Finistère Sud; Finistère Nord; Côtes d' Armor; Presqu’île de Guérande. Image View: The gallery pages are sets of thumbnails that enlarge in an automatic slideshow when clicked. Image information is given on mouseover on the thumbnails, or along the top of th enlargement. Download is not blocked – but of course the usual copyright notice applies. Le Phare, Combrit-Sainte-Marine is 38 x 28 cm, 547 x 550; 286 KB. Bio: Michael Norman was born in 1943 in Clevedon, Somerset. He is a pastel artist living and working in the South West of England. He was elected to membership of the Pastel Society UK in 2007 and became Honorary Treasurer the following year. In recent years he has built up a growing reputation as a talented pastel painter. Having experimented with pastels for some years, he began to appreciate how versatile they are and now prefers them to any other medium. (He painted for many years in oils and watercolours before taking up pastels, and was a member of the Birmingham Watercolour Society.) Most of his work is purely pastel, but he does occasionally combine pastels with watercolour or acrylic paint. 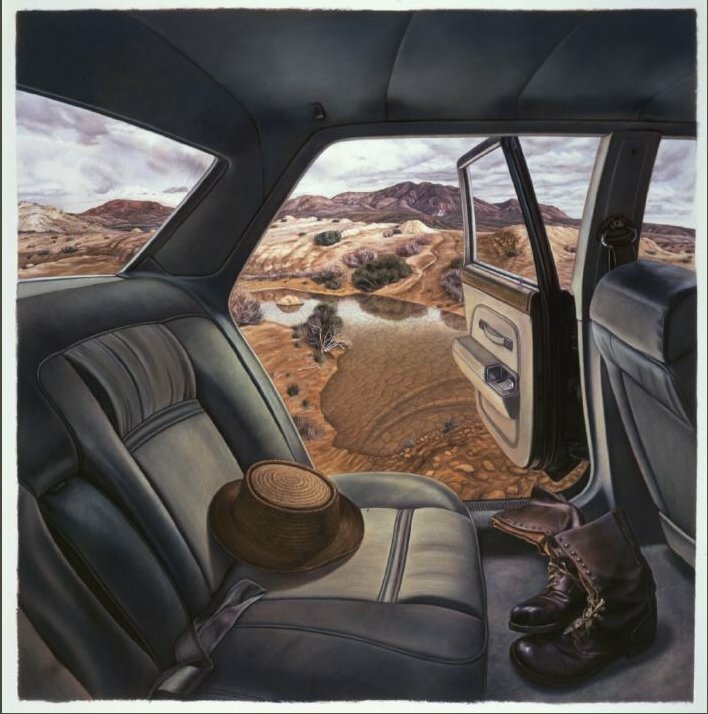 He has won awards for his art, the most recent being the Sarah Samuels Fine Paintings Award, 2006, the Unison Pastels Award, 2007, and the Bill Patterson Memorial Award, 2008. Michael now lives and works in Devon, within ten minutes walk of the Exe Estuary and the South Devon coastline. Michael Norman’s paintings may be viewed in the Fred Keetch Art Shop, The Strand, Exmouth, Devon; Gallery LeFort, 5 Margarets Buildings, Bath; the Appledore Gallery, 31 Bude Street, Appledore, Bideford, Devon. Medium : Pastel. Michel states : I usually work from sketches made on site. I often take a Unison pastels colour chart, which I use to annotate my sketches with colour references. I also use a digital camera for back-up information, and for detail that I may have omitted to record at the time.I paint in soft pastel on either pumice paper, solid-core mountboard, to which I apply a coloured pumice surface, Sennelier pastel card or Canson paper.I quite often make an underpainting in pastel by blocking in all the main areas of colour and then dragging the applied pastel down with the side of my hand over the whole picture area. This creates a ghostlike image, and also has the effect of unifying the colour. I sometimes draw out my subject in charcoal. I usually have three or four paintings in progress at any one time. Subjects: Landscape, especially coastal views. His inland landscapes are quintessentially English, and his Venetian scenes are very fine indeed. Navigation: All links remain available on top of page. A rich and rewarding website. Gallery: Exe Estuary paints; South West Coastal paintings; Landscape paintings; Italy paintings. Image View: The gallery pages are sets of thumbnails that enlarge in a viewer that retains the thumbnails along the top of the slideshow. A download button is provided. My only gripe is that the size of the original paintings is not cited. However 18 x 24 ins or 45 x 60 cm seems to be about right, based on paintings on the LeFort gallery website. Still morning, Camperdown creek is 800 x 609; 134 KB. Bio: Lisa Stauffer received her Master’s in Design from the University Of Minnesota, and she studied Illustration at Parson’s School of Design (NYC). She continued to take workshops from nationally recognized painters whose work inspires her, including Albert Handell, Richard McKinley, Sally Strand and Anita Louise West. She has taught art at the University of Minnesota, the Northern Clay Center in Minneapolis, and the Waterfront Art Works in Duluth, where she currently resides.She was awarded Master Circle status by the International Association Of Pastel Societies (IAPS) in 2009. She was awarded the H.K. Holbein Award at the Pastel Society Of America Show at the National Arts Club in New York City, September 2010, and her painting was one of twenty chosen by the Director of the Butler Institute Of American Art, Youngstown, Ohio, to travel to their exhibit American Pastels, 2010. 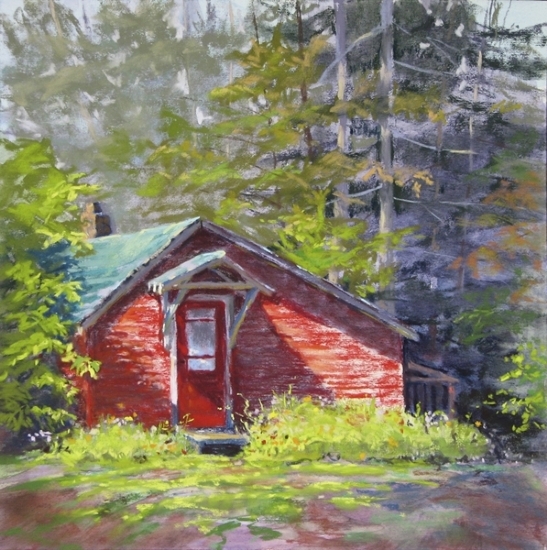 Lisa is represented by Waters of Superior, the Art Dock and Lizzard's Gallery in Duluth. Medium : Pastel. Lisa says: I often use a watercolor underpainting as a setup for the pastel layers in my work, which adds the interplay of transparent and opaque mediums to the visual quality of the final piece. Subjects: Landscape, especially en plein air; Still life. Navigation: All links remain available at left of page. This is a FineArtStudioOnline website. Image View: Four pages of thumbnails that may be viewed in their entirety. Thumbnails enarge in a viewer and may be further enlarged in a new window. Information is provided. Download is allowed. Cottage Tales is 12 in sq; 547 x 550; 286 KB. Bio: Barbara Courtney Jaenicke was born in 1964 in New Jersey. She graduated with a B.A. in Art/Advertising Design, from the College of New Jersey (formerly Trenton State College), in 1986 and spent the next decade as an art director in advertising before working in corporate marketing communications. In 2002, she was able finally to concentrate on her fine art career, as practising artist and instructor. She has studied with Susan Ogilvie, Albert Handell, Anita Louise West, Greg Biolchini, Margaret Dyer, Greg Barnes, Duane Wakeham and Marc Hanson. 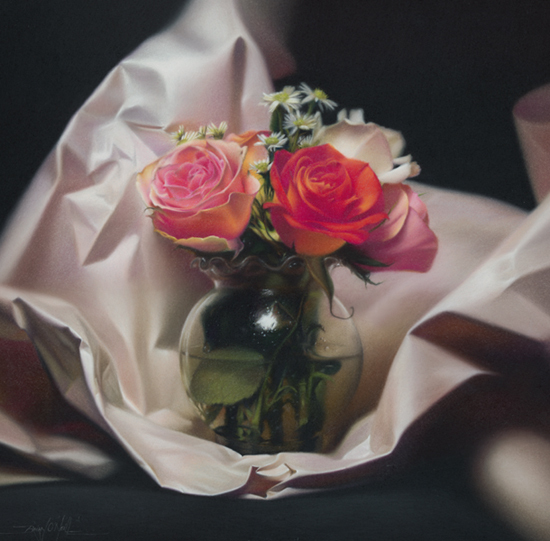 She has won numerous awards for her work, including Honorable Mention in the 12th Annual Pastel 100 Competition, April 2011. 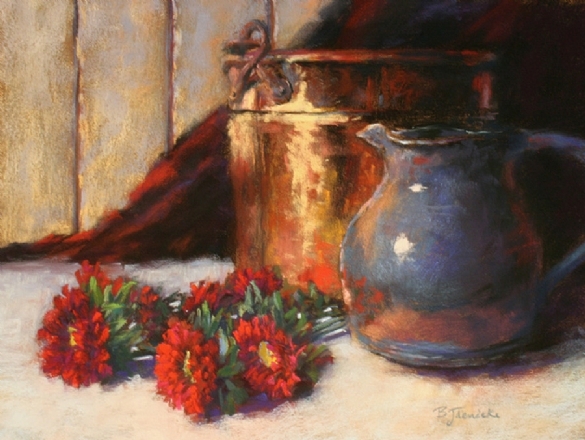 Currently residing in Roswell, Georgia, Barbara teaches weekly pastel classes and various workshops throughout the metro Atlanta area. Her work is available through the Raiford Gallery in Roswell. She is a Signature Member of the Pastel Society of America and a Member of Excellence in the Southeastern Pastel Society. There was a major feature on Barbara’s work, written by Deborah Secor, in the December 2011 issue of the Pastel Journal. Navigation: All links remain available on top of page. This is a well designed and elegant website. Gallery: Paintings: Landscapes; Still Life. Image View: Scrollable thumbnails on top of the viewing window allow one to choose the image to view, or you can scroll backwards or forwards through the bigger image in the viewer. Information on title, medium and size is provided. The bigger image may be further enlarged. Download is allowed. Warm Sunlight on a Cold Winter's Day (14 x 18 ins) is extraordinary in that it reverses the usual warm foreground/cool background approach to landscape - a reversal that works very well in a wintry scene. The painting Copper Pot, Pitcher and Flowers (12 x 16 ins) is a great example of the use of primary colours red, yellow and blue, plus green, to give an integrated, harmonious approach to a colorist still life. Blog: Barbara’s blog is an illustrated diary of her work and workshops. Bio: Françoise Masmontet lives in Sanguinet, in the Landes area of South West France, a region of pine forest and lakes, but within easy reach of the Bay of Biscay. In 2000, Françoise gave up her day-job to concentrate on her art.­ In 2006, she discovered pastel and was immediately seized by the possibilities offered by the medium to her painting style – spontaneity and sensitivity. 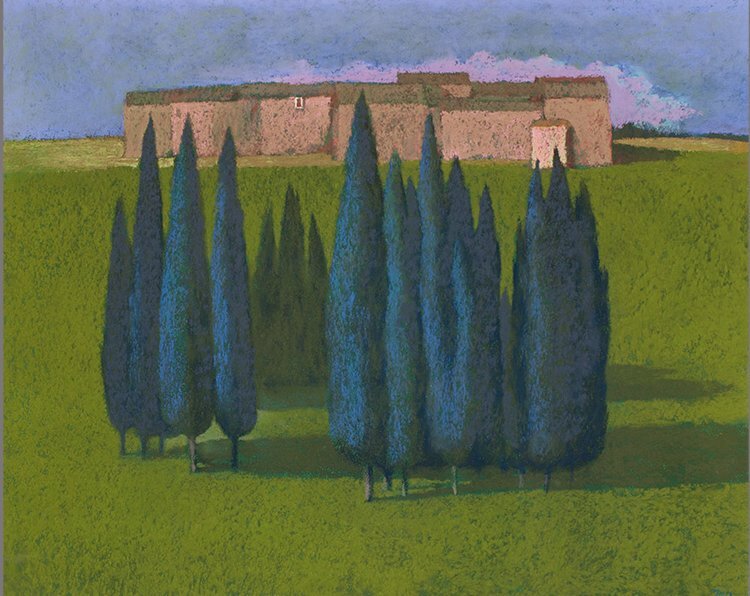 Françoise joined the l’Art du Pastel en France in 2007 and ASPAS in 2009. She has exhibited extensively and been a prizewinner at salons both national and international – in Bordeaux, Giverny, Saint Aulaye, Biscarrosse, Pau, Paris and Oviedo. Résidant dans les Landes et passionée par l'ocean, les lacs et la foret, Françoise Masmontet a depuis toujours tenté de traduire sa vision de cette nature par le dessin et la peinture. 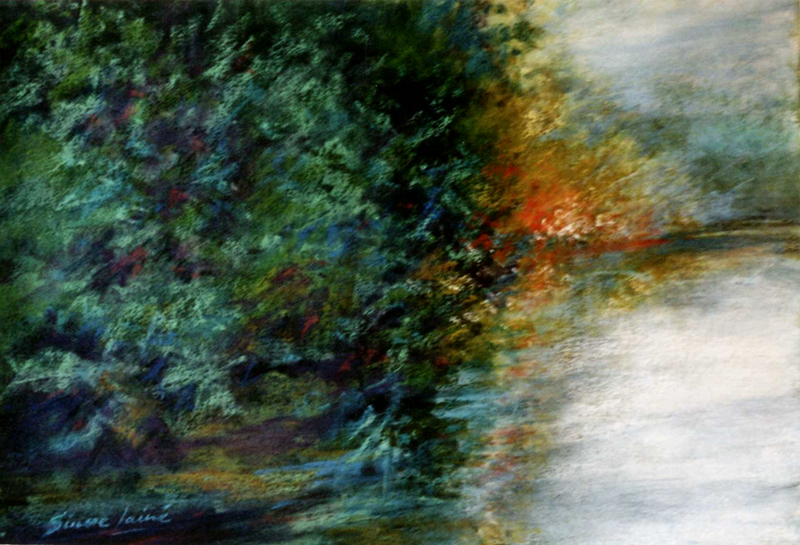 Pastelliste dediée depuis 2006, cette technique correspond parfaitement à sa vision de la peinture: spontenéité et sensibilité. Subjects: Landscape; Seascape; Figurative; Still life. Navigation: All links remain available on left of page. This website is in French, but image navigation is self-evident. Gallery: Galerie 0-11 for Pastels; Galerie 12 of oils. Image View: Each gallery contains 9 thumbnails. Click to see enlarged image in scrollable viewer. Informaton on title, medium and size is provided. Download is not possible. Le Pin couché is 50 x 65 cm. Bio: Ana Bayón is a figurative artist who was born in Buenos Aires, Argentina. She was educated in New York City at the Art Students League, the Frank J. Reilly School of Art and privately. Then went back to Buenos Aires where her artistic career began and where she did a number of shows mainly as a draughtsman. Most recently, her work has been exhibited in the Philadelphia area. Her work is also in private and corporate collections throughout the United States. Her influences were always representational artists and she particularly admires Giacometti, Fernando Fader and Lola Mora. Navigation: All links remain available on left of page. Bio: Born in 1964, Londoner David Napp trained at Canterbury College of Art, England, 1981-1985. He graduated with a first class diploma, Chartered Society of Designers. 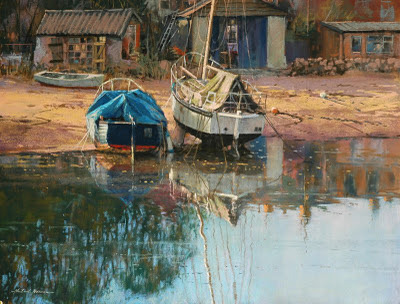 He has exhibited with the Royal Watercolour Society and the Pastel Society, and has held annual solo exhibitions in the Bourne Gallery in Reigate since 1987. (Click on the link to see his portfolio there.) He has also shown in Holland and in the USA. He was Lecturer at the Kent Institute of Art and Design, 1988-1992 and the Grace Barrand Design Centre, 1999-2003. David Napp settled in the south of France because the strong light suited his subject matter and style. His website has him currently residing in Italy. I am a colourist and I seek to enhance the colour quality of the subject matter and use colour to express my reaction to the landscape emotively. Chalk pastels are my main medium because of their tremendous vibrancy of colour and they inspire me to paint with a much richer palette. The general rule of thumb when working with chalk pastel is to work from dark to light. After years of practice with this medium I now enjoy breaking with tradition and experimenting with colour harmonies and contrasts. I look for ways of describing the subject matter that generate unusual harmonies of colour. This creates a strong stance, something that I believe to be characteristic of my work. I will, for example, put bright blues among reds, and magentas into greens, bring cool colours forward and make warm ones recede. I prefer using the vibrant colours of the spectrum and tend to limit the use of earthy natural colours. I often create an under-painting of warm reds, oranges and yellows that come through and create a notion of heat, whilst purples, blues and magentas are used to create cool-feeling shadows. Publications: David Napp has contributed to numerous publications: articles in and covers for the Artists and Illustrators magazine; the front cover and four-page article in The Artist magazine, 2000; and contributions to the Encyclopedia of Pastel Technique, Quarto Publishing, 1992; Trees Flowers and Foliage, Batsford Press, 1994; Pastels Workshop, Harper and Collins, 1994; Colour, Harper and Collins, 1994; Painting Still Life by Peter Graham, David & Charles, 2001. Navigation: All links remain available on right of page. Latest date mentioned on the site is 2009. Image View: Each gallery consists of a number of pages of thumbnails. Each enlargement opens in a new window, with full information in the legend. There is no impediment to download. Casa sul Lago Maggiore is 60 x 80 cm, 517 x 390, 45 KB. Bio: Gérard Jan trained in the graphic studio of Rene Izaure at the Ecole de Beaux-Arts, Toulouse from 1979 to 1985. His early interest was in the play of light and shade, as expressed in monochrome techniques. Indeed, his interest in the technical side of art led to early experiments in casein and in encaustic. Exploring colour in the 1990s, pastel met his requirements for a material that had immediacy, purity, and that could be pushed beyond its apparent constraints. From 2006 – 2009 he has been spending more time in Italy, especially in Rome and in Florence. He has been exhibiting since 1987, in France, Switzerland and Germany. Gérard Jan’s work and technique was featured in an excellent issue of Pratique des Arts, number 97, Mars-Mai 2011. Medium : Pastel, monotypes, etchings, drawings. Subjects: Landscape – trees and hills, and Italian urban architecture. Style: Pared down to the essentials. Navigation: This French website presents a homepage of thumbnail images, together with links to Contact, Expositions and Archives. The thumbnails are assembled in groups of nine, and link to a new page where the nine images are displayed. Gallery: Pages of thumbnails linked to home page (see Navigation). Image View: The thumbnails may be enlarged – there is a zoom function. Each enlargement opens in a new window, where details of medium and dimension are displayed. There is a back (Retour) button. There is no impediment to download. Village is 58 x 72 cm, 924 x 616, 215 KB. 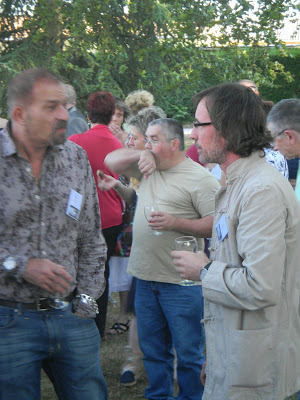 French artists Pierre Caro (left) and Gérard Jan deep in discussion at the Festival International du Pastel, Feytiat, Limoges on July 1st, 2011.